Fashion comes and goes, and one thing it has taught us to keep everything in the wardrobe because it will turn useful and trendy one day! Have a look at Adidas Falcon Dorf, first created in 1997 and back again today. 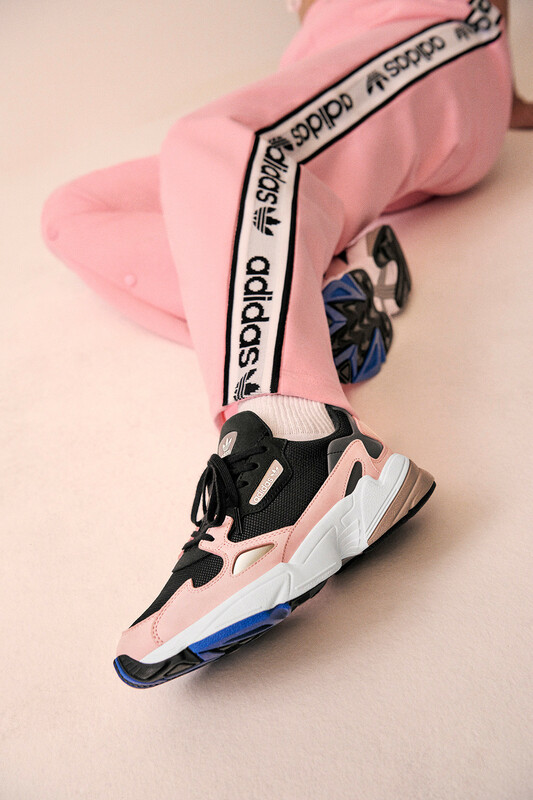 The Adidas Originals shoe, characterised by a sculpture rubber sole has been redesigned and is now part of the new collection, fronted by young entrepreneur (and more) Kylie Jenner. The Falcon Dorf runner will be available for sale on September 6 and is currently in women’s only sizes. To celebrate the re-launch, the sports brand has chosen the US model who was born in the same year of the iconic shoe, creating a whole nostalgic collection in crowning Jenner as new Ambassador. The photoshoot shows her wearing basic old-school Adidas items, totally in pink, white and black, presenting classic sweaters, trousers, socks and a cap. “We are interested in creating tomorrow’s streetwear by reinventing the most iconic sportswear from our archive,” says Alegra O’Hare, vice president of the brand’s global communications. Thanks to the appeal and popularity of Kylie, the quality of the legendary brand and the choice to re-cover such a trendy shoe, it will be a success. Have a look at the anticipated collection below.